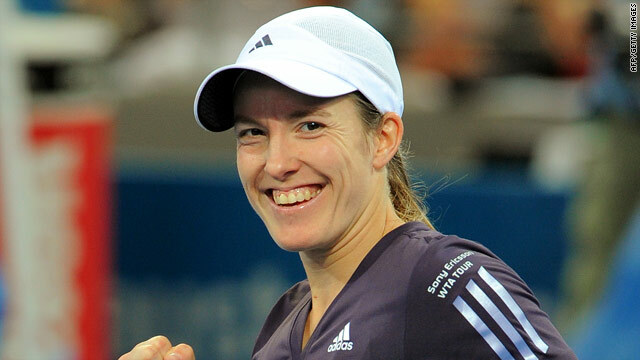 Justine Henin showed she is in fine form on the comeback trail with another straight sets win. (CNN) -- Justine Henin continued her winning return to tennis with a straight sets win over Kazakhstan's Sesil Karatantcheva at the WTA tournament in Brisbane on Wednesday. Henin, who put out second seed Nadia Petrova of Russia in her first round match, secured a 6-4 6-3 victory in one hour 17 minutes to reach the quarterfinals. The former world number one is returning to competitive tennis after an 18-month retirement and targeting the opening grand slam of 2010 at the Australian Open. She made a shaky start as she dropped her opening service game, but broke back and took total control with a second break against the determined qualifier in the eighth game. Henin also dropped service twice in the second set, but a run of five straight games set up victory, which she secured with a forehand winner. Her fellow Belgian and arch-rival Kim Clijsters reached the last eight of the top-tier tournament on Tuesday and could meet Henin in the final should both progress. Clijsters also made a comeback last summer after a two-year retirement and promptly won the U.S. Open, inspiring Henin to make a return. Clijsters will place Czech Lucie Safarova for a place in the semifinals after she beat sixth seed Aleksandra Wozniak of Canada 6-3 6-1 earlier on Wednesday. In the accompanying men's tournament in Brisbane, top seed Andy Roddick cruised into the quarterfinals of the Brisbane International with a 7-6 6-3 win over Australian Carsten Ball. Roddick showed he is fully recovered from the injuries which ruined his end of season campaign in 2009 with a confident display. He now faces Richard Gasquet, who stepped up his comeback after a drugs row derailed his career, with a 6-3 6-4 win over Australian Matthew Ebden 6-3 6-4.